In many ways, I have accomplished the sorts of things we praise toddlers for: I’m eating solid foods! I’m using a fork! I’m getting new teeth (coming soon), and sleeping through the night! Oh, and I had to get one of those ear tubes, also known as” tympanostomy tubes or grommets,” due to a case of airplane ear. My kids had their share of ear infections when they were little, but never had to get an ear tube. Lucky for them–it really hurt! Apparently, many folks who have my kind of surgery need to get one of these things to help keep the eustaschian tubes clear. Just one more bump in this long and winding road to recovery! So I have graduated to soft foods, which has been a source of great joy. While soup is still my fallback, the world has opened a little wider in the area of Foods I Can Eat Comfortably. And speaking of things opening a little wider, my challenging tongue-depressor jaw exercises have apparently been working, so in the next couple of weeks (drum roll…) I will be getting a temporary obturator that features replicas of my very own departed molars. Instead of the retainer-with-a-sidecar (and oh! how I wish I could drink a sidecar these days…), I will have a retainer with some teeth attached, which will probably remind me of the ghastly dentures my grandmother used to soak in a glass. Maybe I can get one with some embellishments or glitter. Doubtful. As my doctor told me this week, the numbness can last a very long time. It may never completely go away, but I am encouraged by the changes in just the last few weeks. 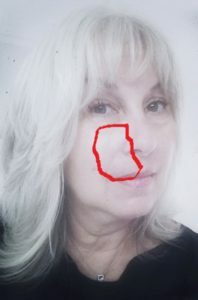 My doctor refers to my newly missing parts as “the defect.” I guess it’s one way to describe this void I have in place of a section of jaw and those departed teeth, but I like to think of my healing process as fixing a hole. I was always such a Paul girl… some things never change. And this is a sidecar. Have one for me, if you like. 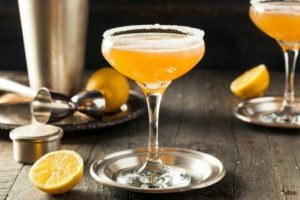 Traditionally: Cointreau, cognac, lemon juice, sugar rim. Cheers! Thank you so much, Marcia!! I’ll definitely have one for you, Risa! So glad you are “developmentally” advancing to soft foods. I look forward to a future post telling us Ms. Barstool is back in business! You’re doing great, so keep up the good work. Risa, am so happy to hear of your progress. You’ve been amazingly strong through this. Thanks, Carol. It’s been a struggle, but I’m trying to focus on the progress I’ve made so far! Great, great news. And delivered with such style and grace. Keep on keepin’ on beautiful friend. I hope your wonderful mind never stops its wandering. Glad to hear things are getting better! Go get em champ! Wish the progress were faster, but I’m glad it isn’t slower. Thanks for these bulletins. Admire your grit and humorous spins on what has obviously been a difficult journey. Hang in there! Ready for a pastina party yet? I’ll have some shipped in. I’m always up for some pastina! Thanks!